The Green Lantern, created in 1940, is one of the few superheroes to have several secret identities from all over the universe. These variations make collecting Green Lantern memorabilia a fun and challenging endeavor as fans often have their favorite Lanterns to collect. This guide compiles the key collectibles for one of DC’s most enduring and beloved characters. 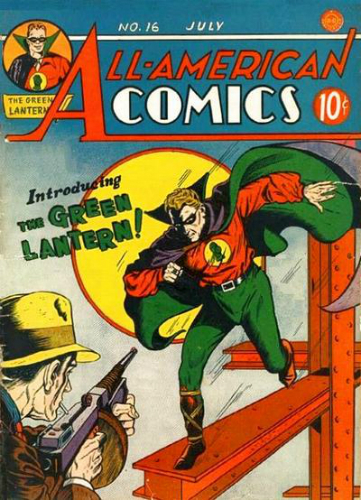 First appearing in All-American Comics #16 in 1940, the original Green Lantern (Alan Scott) stopped appearing in publications in 1949 and the character was essentially abandoned for a decade until the reinvention in 1959. During that nine-year period, Green Lantern was established as a regular man emboldened by the use of a magical ring which was recharged by an actual green lantern. The character was also an off-and-on member of the Justice Society of America, a supergroup preceding the Justice League by 20 years. The 1959 reintroduction of the character, now Hal Jordan, took many elements of the original publication but added a science-fiction element with the ring now belonging to the Green Lantern Corps, a group of interstellar protectors and enforcers. Alan Scott was not considered part of this new continuity and, as such, was not related to the modern Green Lantern mythology. However, he has appeared as a guest hero in many comic books throughout the DC Universe from a parallel Earth. Since the reinvention, there have been many people to take on the Green Lantern name, including Guy Gardner, Kyle Rayner, John Stewart, and Simon Baz, as well as dozens of Lanterns from other planets. 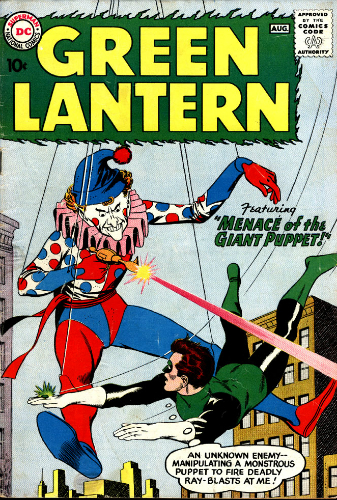 There are also Lanterns of various colors which each represent a different corps and and are powered by different emotions than Green Lantern’s willpower. Other versions include Black (death), Orange (greed), Red (rage), Yellow (fear), Blue (hope), Indigo (compassion), and White (life). Collecting Green Lantern can be very confusing as there are multiple options from many eras of the franchise. The main character and ancillary subjects remain incredibly popular among fans of DC Comics and have appeared in movies, television shows, and video games. 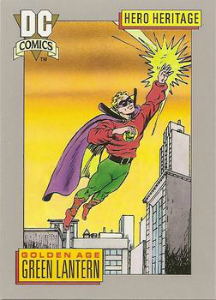 Further, characters like the original Alan Scott continue to return, both in and out of continuity, in various parallel universes in many different eras. This guide will help you begin your trip down the rabbit hole that is Green Lantern collecting that, whether brightest day or darkest night, can be an incredibly rewarding endeavor. Refer to the tabs above for a rundown of the key Green Lantern comics, trading cards and figures. Hal Jordan and the Green Lantern Corps #49 cgc 9.8 signed by Tyler kirkham!! Green Lantern has appeared in many books, including anthologies, group team-ups, and eponymous titles. 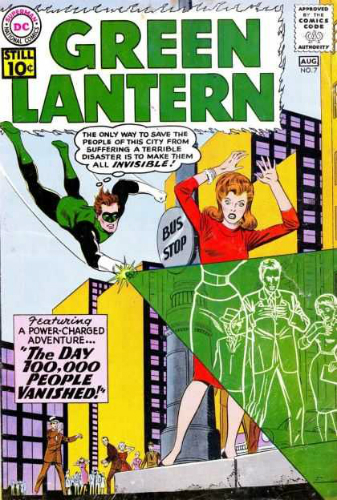 This list highlights the titles in which a specific Lantern made his debut as well as important publications in the overall history of the character. 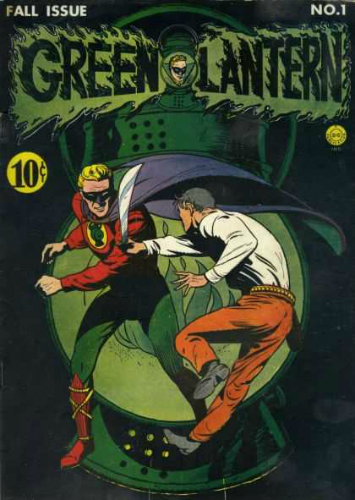 The original Green Lantern, Alan Scott, made his comic debut on the pages of All-American Comics #16 and appeared in several issues in this series prior to receiving his own title. Issues of this comic can be difficult to find online so it is important for collectors to keep an active search open for these rare collectibles. 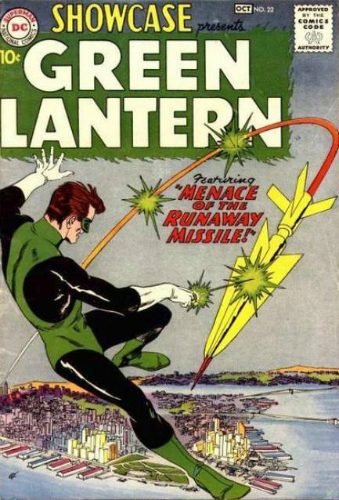 Based on the success of his All-American Comics appearances as well as his popularity in the Justice Society, Green Lantern was given his own title in 1941. In March of 2016, a copy graded at 1.5 with brown pages and a ripped page sold for over $1,800. It's not terribly common to find these issues outside of auction houses or private dealers. 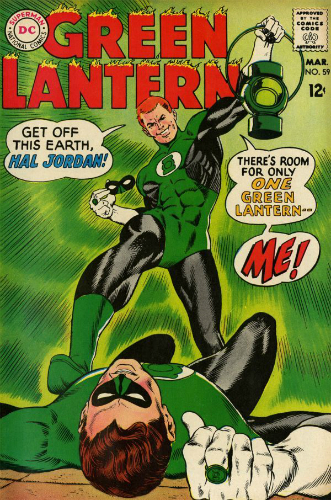 In October of 1959, the decade-long absence of Green Lantern in comics ended with the premiere of Hal Jordan as the Silver Age Lantern. His first appearance was on the pages of Showcase #22, a series that also premiered the Silver Age Flash in issue #4. There were three issues released in his introductory arc and from there the character was granted his own title. Obviously, issue #22 is the bigger collectible with a price tag often ten times that of issues #23 and #24. In terms of what serious collectors have to spend for premiere issues of major comic book franchises, Green Lantern #1 is usually a fairly reasonable comic to acquire. This is largely due to the fact that the character debuted another book prior to issue #1. The series ran for 82 issues, ending in 1972. Sinestro is a discharged Lantern and one of the comic’s most legendary foes. Using the power of a yellow ring, Sinestro has remained a popular nemesis over half a century after his 1961 debut in Green Lantern #7. Issues of this comic regularly sell for several hundred dollars on online auctions. Although very different than the character portrayed in the comic books of the 1980s and 90s, Green Lantern #59 is the official introduction of Guy Gardener. The Gardner version of Green Lantern, who would headline his own book in the 1990s, is a macho American patriot that has been included in the Justice League. While the bulk of his popularity is in the junk era, his premiere comic can go for a few hundred dollars. 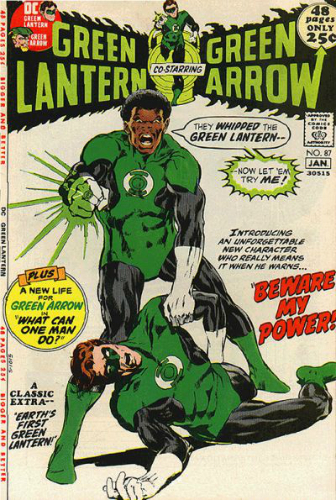 Issue #87 of Green Lantern marked the debut of John Stewart who was the first black superhero of DC Comics. The enhanced historical significance of this comic makes it a particularly valuable issue with auction prices of highly graded copies selling for over $1,000. 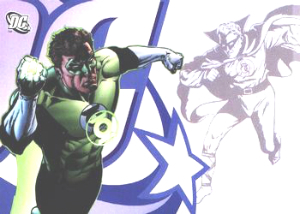 John Stewart would go on to be the featured Lantern following Hal Jordan. In addition to headlining comics in the 1980s and 1990s, he appeared in animated television programs and hosted a late night talk show. 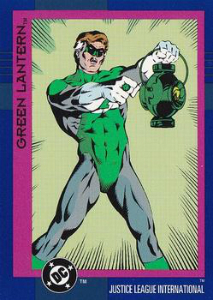 Despite being the subject of a major motion picture, Green Lantern has never been the cornerstone of a trading card set. The character has been a prominent figure in nearly every DC Universe set, though, and is often included in chase sets. Below are the manufacturers to be on the lookout for if you’re collecting Green Lantern trading cards. Impel released the first DC Universe cards with 1991’s Cosmic Cards set. The set covers all three Green Lantern eras, notable comic book covers, and a hologram insert. Die-hard collectors may even wish to track down an unopened pack with a Green Lantern design. These sets, released at the height of the junk wax era, are easy to find and fairly cheap. 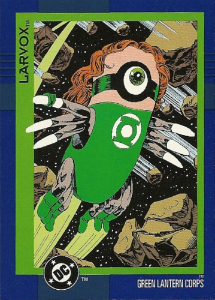 To date, the bulk of DC’s trading card sets were released by Skybox throughout the 1990s. As previously noted, Green Lantern appeared in nearly all of them. Beginning with 1993 Cosmic Teams, which included a tri-card image of the entire Green Lantern corps, additional issues continued with 1994 DC Master Series (which has Green Lantern on the box top), 1994 Comic Stars, 1995 Legends Power Chrome, 1996 Firepower, and others. 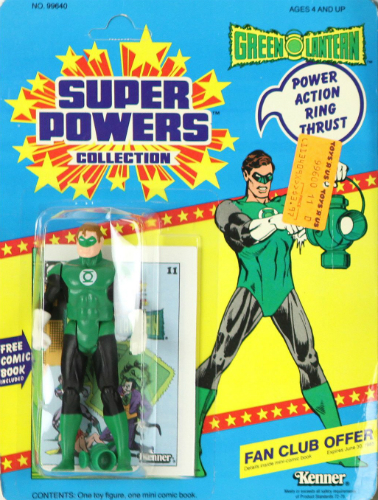 Green Lantern is featured in chase sets, parallels, inserts, and promos for nearly every one of these sets and because there are so many iterations of the character, base sets often have several versions of the Lantern. 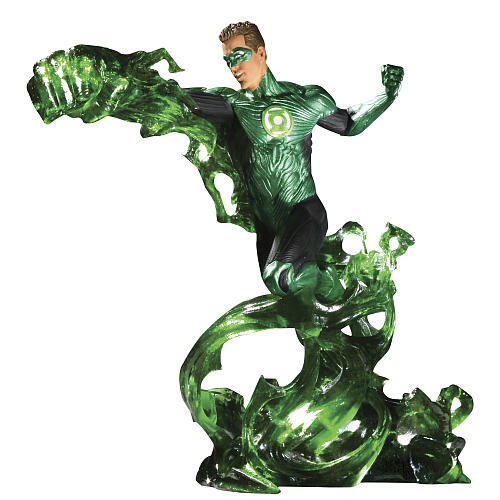 For collectors seeking a higher quality alternative to the junk wax era sets that flood the online market, Rittenhouse has released a few sets that include Green Lantern. What helps these stand out is the limited release and the inclusion of sketch cards along with a wider variety of chase sets. Options include 2007 DC Legacy and 2007 Justice League. 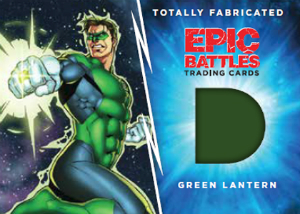 The modern manufacturer for DC trading cards has been Cryptozoic for several years and they have released a number of sets that include the Green Lantern. Still offering sketch cards and chase sets, Cryptozoic also includes faux relic cards, including Green Lantern, that feature fabric swatches in the color schemes of the character’s costume. Sets include 2016 Justice League, 2015 Super Villains, 2012 New 52 (which include lantern shaped sketch cards), 2014 Epic Battles (with relic cards), and 2014 Women of Legend. DC Comics Epic Battles Color Sketch card Green Lantern Hal Jordan Elton Thomasi! Cryptozoic DC Epic Battles Totally Fabricated TF-05 Green Lantern Costume Card! Although not quite as plentiful as many of the other established heroes, Green Lantern still has enough figures to keep collectors very busy. We check out the key options below, including notable action figures, statues, and those that fall under the Funko brand. Unlike many of DC’s most iconic characters, Green Lantern never received the Mego treatment so collectors should be wary of auctions claiming to be Mego figures. However, he was one of the original 12-back Kenner action figures produced throughout the 1980s as part of their Super Powers line. A figure still in the packaging from this line can be fairly valuable and is commonly found online. Modern figures offer a great number of additional options from Mattel and DC Direct. These action figures are currently less valuable than the vintage Kenner toys, but with so many options they can be a more rewarding collecting experience. The statue market is, sadly, under representing the massive universe that Green Lantern comics has established. As is almost always the case, Sideshow has produced some outstanding figures that regularly sell for hundreds of dollars, including a ¼ scale premium statue. All of their figures are limited editions and maintain or exceed their retail value exceptionally well. Beyond Sideshow statues, collectors are primarily bound to DC Direct offerings, which are striking, and often found in exciting poses/action scenes, but of significantly less quality to the Sideshow counterparts. Funko have released several Green Lantern figures including a 2010 SDCC exclusive that has sold online for over $1,000. In fact, there are several figures in the Funko line that have become quite valuable among collectors, many of which are comic convention or retail exclusives. 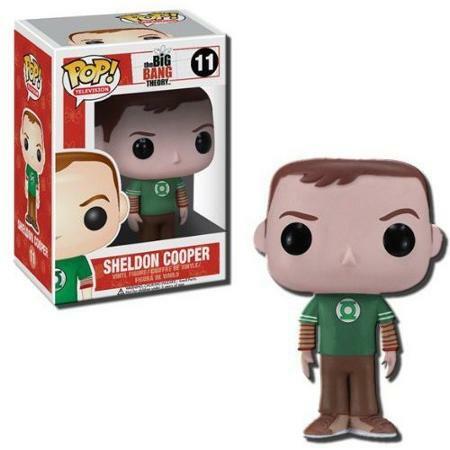 The Green Lantern appears in most Funko lines that feature DC Superheroes and is even represented in the Big Bang Theory line with Sheldon Cooper wearing a Green Lantern t-shirt. Do not discount Funko figures as a novelty children’s toy as the collector market for these figures is currently one of the strongest surrounding comic book characters. Funko Pop! Teen Titans Go! Cyborg as Green Lantern #338 Toys R Us Exclusive! Green Lantern #2 1960 CGC 5.5 Early Silver Age DC Beauty Cheap!